SolFocus, a startup that designs and builds solar concentrating photovoltaic systems, says this morning that it has completed the first 200-kilowatt phase of a sizable 3 MW system in Castilla-La Mancha, Spain. The solar plant, which SolFocus claims is the world’s first commercial-scale concentrating photovoltaic system, is owned by the Spanish Institute of Concentration Photovoltaic Systems (ISFOC). It will both produce clean power and act as a testing ground for various concentrating solar PV technologies. Concentrating solar PV is a more nascent technology compared to both traditional solar photovoltaic systems and solar thermal plants that use the sun’s heat to produce power. 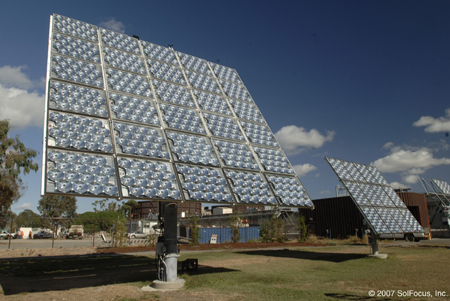 The concentrating photovoltaic plants use arrays with lenses and curved mirrors to focus sunlight onto cells in order to produce more power with less material. In the case of SolFocus, the startup says its concentrating technology allows a one-square-centimeter cell to capture more than 500 square centimeters of sunlight. Such a setup reduces the number of expensive panels used, which can significantly cut down on the cost of the system; SolFocus says it uses 0.1 percent of the solar cell material required by a standard PV setup. The startup, which is based in Mountain View, Calif., and has a sister company, SolFocus Europe, in Madrid, has been filling its war chest to help it build more systems like the ISFOC plant. In June the two-year-old company was reportedly looking to add between $60 million and $80 million in a Series C round. Previously the company was funded to the tune of $95 million by New Enterprise Associates, Moser Baer India, David Gelbaum, Metasystem Group, NGEN Partners and Yellowstone Capital. Next up, the company begins work on the second phase of the ISFOC project, boosting its total capacity to 500 kW.